All code samples can be found at GitHub. Being aware of when new functions are created and when you need to make sure the memory being held by closure is released (dropped out of scope) can be important for code that’s hot otherwise you’re in danger of introducing subtle memory leaks. // if you don't want to wait for the machine to heat up assign minutes: 2. // Perform long running action, delegating async tasks passing callback and returning immediately. // Flick switch, check water. // Even if you call setTimeout with a time of 0 ms, the callback you pass is placed on the event queue to be called on a subsequent turn of the event loop. // Also be aware that setTimeout has a minimum granularity of 4ms for timers nested more than 5 deep. For several reasons we prefer to use setImmediate if we don't want a 4ms minimum wait. // For this, we need to wait for our huge hunk of copper to heat up, which takes a lot longer than a few milliseconds. // Perform long running action. // To save on writing large amounts of code, the callback would get passed to something that would run it at some point in the future. // We would then return immediately with the expectation that callback will be run in the future. // Uncomment the below to test the error. // if you don't want to wait for the machine to heat up assign minutes: 0.2. // Some prep work here possibly. Ranging from marginally good approaches to better approaches. Keeping in mind that all these techniques add value and some make more sense in some situations than others. They are all approaches for making the callback hell more manageable and often encapsulating it completely, so much so that the underlying workings are no longer just a bunch of callbacks but rather well thought out implementations offering up a consistent well recognised API. Try them all, get used to them all, then pick the one that suites your particular situation. The first two examples from here are blocking though, so I wouldn’t use them as they are, they are just an example of how to make some improvements. We’ve made some improvements in the next two examples, but introduced blocking in the arrays prototypes forEach loop which we really don’t want to do. // Array.prototype.forEach executes your callback synchronously (that's right, it's blocking) for each element of the array. Now satisfies all the points above, providing the same output. Hopefully you’ll be able to see a few other issues I’ve addressed with this example. We’re also no longer clobbering the global scope. We can now also make any of the other types of coffee simply with an additional single line function call, so we’re removing duplication. I’ll address these in another post. In most of the examples I’ve created in this post I’ve exported the system under test (SUT) modules and then required them into the test. Node modules are very easy to create and consume. requireFrom is a great way to require your local modules without explicit directory traversal, thus removing the need to change your require statements when you move your files that are requiring your modules. Here we get to consume npm packages in the browser. That’s right, we’re getting modules as part of the specification (15.2). Check out this post by Axel Rauschmayer to get you started. Still creates more garbage unless your functions are on the prototype, but does provide asynchronicity. 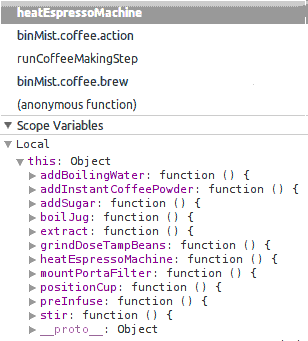 Now we can put our functions on the prototype, but then they’ll all be public and if they’re part of a process then we don’t want our coffee process spilling all it’s secretes about how it makes perfect coffee. 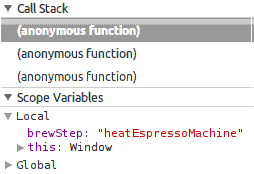 In saying that, if our code is hot and we’ve profiled it and it’s a stand-out for using to much memory, we could refactor EventEmittedCoffee to have its function declarations added to EventEmittedCoffee.prototype and perhaps hidden another way, but I wouldn’t worry about it until it’s been proven to be using to much memory. Events are used in the well known Ganf Of Four Observer (behavioural) pattern (which I discussed the C# implementation of here) and at a higher level the Enterprise Integration Publish/Subscribe pattern. The Observer pattern is used in quite a few other patterns also. 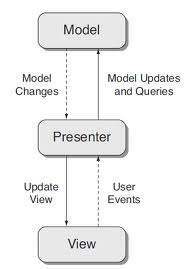 The ones that spring to mind are Model View Presenter, Model View Controller. The pub/sub pattern is slightly different to the Observer in that it has a topic/event channel that sits between the publisher and the subscriber and it uses contractual messages to encapsulate and transmit it’s events. // We could even assign multiple event handlers to the same event. We're not here, but we could. var events = require('events'); // Core node module. var util = require('util'); // Core node module. // No need for callbacks. We can emit a failedOrder event at any stage and any subscribers will be notified. // If you want to fail the order, replace the above two lines with the below two lines. // Make sure util.inherits is before any prototype augmentations, as it seems it clobbers the prototype if it's the other way around. With using raw callbacks, we have to pass them (functions) around. With events, we can have many interested parties request (subscribe) to be notified when something that our interested parties are interested in happens (the event). The Observer pattern promotes loose coupling, as the thing (publisher) wanting to inform interested parties of specific events has no knowledge of it’s subscribers, this is essentially what a service is. take a collection of functions to execute in specific orders asynchronously, some based on different criteria. The likes of async.waterfall allow you to pass results of a previous function to the next. Don’t underestimate these. There are a bunch of very useful routines. // No need for callbacks. We can just pass an error to the async supplied callback at any stage and the onCompletion callback will be invoked with the error and the results immediately. // If you want to fail the order, uncomment the below line. May as well change the description too. Check out my post on prototypes. If profiling reveals you’re spending to much memory or processing time creating the objects that contain the functions that are going to be used asynchronously you could add the functions to the objects prototype like we did with the public brew method of the EventEmitter example above. The concepts of promises and futures which are quite similar, have been around a long time. their roots go back to 1976 and 1977 respectively. Often the terms are used interchangeably, but they are not the same thing. You can think of the language agnostic promise as a proxy for a value provided by an asynchronous actions eventual success or failure. a promise is something tangible, something you can pass around and interact with… all before or after it’s resolved or failed. The abstract concept of the future (discussed below) has a value that can be mutated once from pending to either fulfilled or rejected on fulfilment or rejection of the promise. Promises provide a pattern that abstracts asynchronous operations in code thus making them easier to reason about. Promises which abstract callbacks can be passed around and the methods on them chained (AKA Promise pipelining). Removing temporary variables makes it more concise and clearer to readers that the extra assignments are an unnecessary step. A promise must only change it’s state once and can only change from either pending to fulfilled or pending to rejected. Semantically a future is a read-only property. A future can only have its value set (sometimes called resolved, fulfilled or bound) once by one or more (via promise pipelining) associated promises. Futures are not discussed explicitly in the Promises/A+, although are discussed implicitly in the promise resolution procedure which takes a promise as the first argument and a value as the second argument. Then we have Dominic Denicola’s promises-unwrapping repository (3) for those that want to stay ahead of the solidified ES6 draft spec (4). Dominic’s repo is slightly less specky and may be a little more convenient to read, but if you want gospel, just go for the ES6 draft spec sections 25.4 Promise Objects and 7.5 Operations on Promise Objects which is looking fairly solid now. Although it was decided to drop promises from Node core, we’re getting them in ES6 anyway. V8 already supports the spec and we also have plenty of libraries to choose from. Node on the other hand is lagging. Node stable 0.10.29 still looks to be using version 3.14.5.9 of V8 which still looks to be about 17 months from the beginnings of the first sign of native ES6 promises according to how I’m reading the V8 change log and the Node release notes. Use the native browser promise API of which all ES6 methods on Promise work in Chrome (V8 -> Soon in Node), Firefox and Opera. Then polyfill using the likes of yepnope, or just check the existence of the methods you require and load them on an as needed basis. The cujojs or jakearchibald shims would be good starting points. For my examples I’ve decided to use when.js for several reasons. Currently in Node we have no native support. As stated above, this will be changing soon, so we’d be polyfilling everything. It’s performance is the least worst of the Promises/A+ compliant libraries at this stage. Although don’t get to hung up on perf stats. In most cases they won’t matter in context of your module. If you’re concerned, profile your running code. It wraps non Promises/A+ compliant promise look-a-likes like jQuery’s Deferred which will forever remain broken. // We could use a then just as we've used the promises done method, but done is semantically the better choice. It makes a bigger noise about handling errors. Read the docs for more info. // result will be wrapped in a new promise and provided as the parameter in the promises then methods first argument. //reject(new Error('Something screwed up here')); // You'll know where it originated from. You'll get full stack trace. // The promise takes care of all the asynchronous stuff without a lot of thought required. // throw new Error('Something screwed up here'); // You'll know where it originated from. You'll get full stack trace. // Deal with the error. Possibly augment some additional insight and re-throw. // Only deal with the error type that we know about. // All other errors will propagate to the next catch. whenjs also has a finally if you need it. // Todo: KimC. Do the dealing with e.
// when's promise.catch is only supposed to catch errors derived from the native Error (etc) functions. // Although in my tests, my catch(CustomError func) wouldn't catch it. I'm assuming there's a bug as it kept giving me a TypeError instead. // Looks like it came from within the library. So this was a little disappointing. All of the tests I demonstrated above have been integration tests. Usually I’d unit test the functions individually not worrying about the intrinsically asynchronous code, as most of it isn’t mine anyway, it’s C/O the EventEmitter, Async and other libraries and there is often no point in testing what the library maintainer already tests. When you’re driving your development with tests, there should be little code testing the asynchronicity. Most of your code should be able to be tested synchronously. This is a big part of the reason why we drive our development with tests, to make sure your code is easy to test. Testing asynchronous code is a pain, so don’t do it much. Test your asynchronous code yes, but most of your business logic should be just functions that you join together asynchronously. When you’re unit testing, you should be testing units, not asynchronous code. When you’re concerned about testing your asynchronicity, that’s called integration testing. Which you should have a lot less of. I discuss the ratios here. As of 1.18.0 Mocha now has baked in support for promises. For fluent style of testing promises we have Chai as Promised. And again all of the code samples can be found at GitHub. What are the differences in creating an object by way of simple function invocation, vs using a constructor vs creating an object using the object literal notation vs function application? The ECMAScript language types are Undefined, Null, Boolean, Number, String and Object. All other values are objects. Function, String, Number, RegExp etc all indirectly inherit Object via their prototype property, which has a hidden link to Object. Try not to get confused about the fact that we can have for example a String primitive which isn’t an object and we can have a String object by calling the String constructor. See the ES3 and ES5 spec 15.5. An object created from a function has a “prototype” property (an Object) (seen below in the red box) (whether invoked as a constructor or function). It has a property which is a constructor function (seen below in blue box) and a hidden property (a link) to the actual Object.prototype (seen below in the pink box). An object created by means of an object literal inherits straight from (is linked to) Object.prototype. So the “prototype” property doesn’t exist, but there are other ways to access it. Problem is… how to access it varies from browser to browser. Every function is also created with two additional hidden properties: the functions context and the code that implements the functions behaviour. On invocation, every function receives 2 hidden parameters. this and the arguments array (which provides access to all the arguments that were supplied to the function on invocation). The value assigned to this is determined by how the function was invoked. We’ll look at this in the following sections. Best suited for creation of one-time on-demand objects. 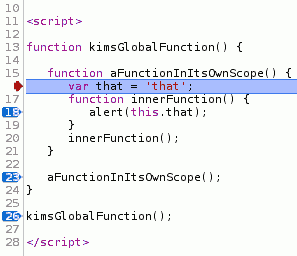 Now here you can see when we invoke the local function, the this is bound to the global object. That’s a mistake in the language. When innerFunction is invoked, the this of that function is also bound to the global object. Line 18 above alerts undefined, because that doesn’t belong to the global object. It’s a function, nothing more. It’s how it is invoked that determines it as a constructor. // Create a constructor function called MyFunc. // The following variable is private. // Access it with a privileged method. // Prefixing with new means we're now using the function as a constructor. // So we use PascalCase rather than camelCase, so users of MyFunc don't invoke without the new prefix. Great for re-use. Creating a constructor and assigning members to it’s prototype, mean that every time you create an object from the constructor using the new prefix, the new object uses the same prototypes members. This can save big time on memory if you are creating many objects with the constructor. What happens when someone invokes a constructor function directly without the new prefix? The this of the function will not be bound to the new object, but rather to the global object. so instead of augmenting your new myFunc object, you will be clobbering the global object. What counter measures do we have at our disposal to make sure this doesn’t happen? Line 12 executes the creation and return of an object with a property called publicString. The this is bound to where you’d expect it to be (adherence to Principle of least astonishment (POLA). Here you can see that the value of myFunc‘s this argument is in fact the myObjectLiteral. As with storing members in a function, be it a function you intend using new with (a constructor), or just by invoking the function, members will not be shared between instances of the prototype. This means that if you create 200’000 myObj object literals as I did in the test above, you will have 200’000 separate add functions in memory. The same goes for adding the add function to the constructor without adding it to the constructors prototype. There is one more object creation pattern. Function application. I’ve discussed this in depth in the following three posts. Check them out. Object creation is significantly slower using constructors with no prototype than it is using object literals. Now I did some more testing around this and got some surprising results. Using Chromium, V8 is doing some severe optimisation with object creation using constructors. The more members I added to my test constructor and object literal, the more it became noticeable. By simply adding another function to the constructor and the object literal, the results in chromium swung to favour the constructor. 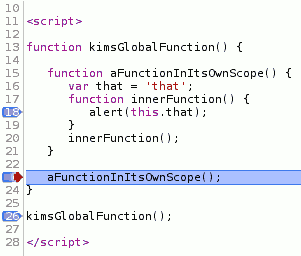 // add this function to the constructor. // add this function to the object literal. I decided to create some tests on jsperf to provide repeatable results. What’s interesting is you don’t have to change a lot to get completely different results, so if you’re concerned about performance, it really pays to test it. I think the tests on jsperf are probably a bit more truthful. here they are. Will help you focus on the areas that matter most. There are of course many other areas to look at when it comes to “is your app delivering an acceptable user experience”. Take a few steps back from your situation. You only have so much time. Spend it wisely. There are many good wins to be had for little cost. Yahoos YSlow has a bunch. I’ve found that most of it’s intuitive and if your using good design and coding principles, in “most” cases your safe, but it’s still worth the read. We don’t use floats when we only need ints. Assign your array elements as early as possible. Don’t delete elements in an array, or leave elements empty. Prototypal inheritance is more OO than classical inheritance. With prototypal inheritance, a child object only needs to inherit the parent objects specific properties pertinent to it. With classical inheritance, a child object inherits all the parent objects members, even the ones that it should have no knowledge of. Angus Croll is a master at explaining these concepts, so be sure to check out his post here. Even the Java creator James Gosling says he’d do away with classes or classical inheritance if he could write the language again. 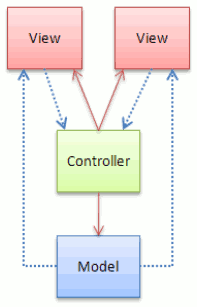 Inheritance can be an anti pattern as it’s tight coupling. Sub classes inherit everything no matter what. Prototypal is opt-in. 1) Program to an interface, not an implementation. 2) Favour object composition over class inheritance. In a sense, the second principle could follow from the first, because classical inheritance exposes the parent class to all child classes. The child classes are all programming to an implementation rather than an interface. Classical inheritance breaks the principle of encapsulation, and tightly couples the child classes to its ancestors. Tight coupling. Classical inheritance is the tightest coupling available in OO design. Descendant classes have an intimate knowledge of their ancestor classes. Inflexible hierarchies. Single parent hierarchies are rarely capable of describing all possible use cases. Eventually, all hierarchies are “wrong” for new uses—a problem that necessitates code duplication. Complicated multiple inheritance. It’s often desirable to inherit from more than one parent. That process is inordinately complex and its implementation is inconsistent with the process for single inheritance, which makes it harder to read and understand. Brittle architecture. Because of tight coupling, it’s often difficult to refactor a class with the “wrong” design, because much existing functionality depends on the existing design. The Gorilla / Banana problem. Often there are parts of the parent that you don’t want to inherit. Subclassing allows you to override properties from the parent, but it doesn’t allow you to select which properties you want to inherit. Eric Elliott’s talk at the fluent conference May 28-30, 2013.